The first time we ever tried Dan Dan Noodles was in a strip mall restaurant in Alhambra, CA. We had no idea what any of the dishes tasted like, but the name rolled off the tongue easily enough, so we went with it. At the time, it felt like we were taking a chance and rolling the dice. Little did we know the dice were loaded and we could do no wrong: everything on the menu was delicious. 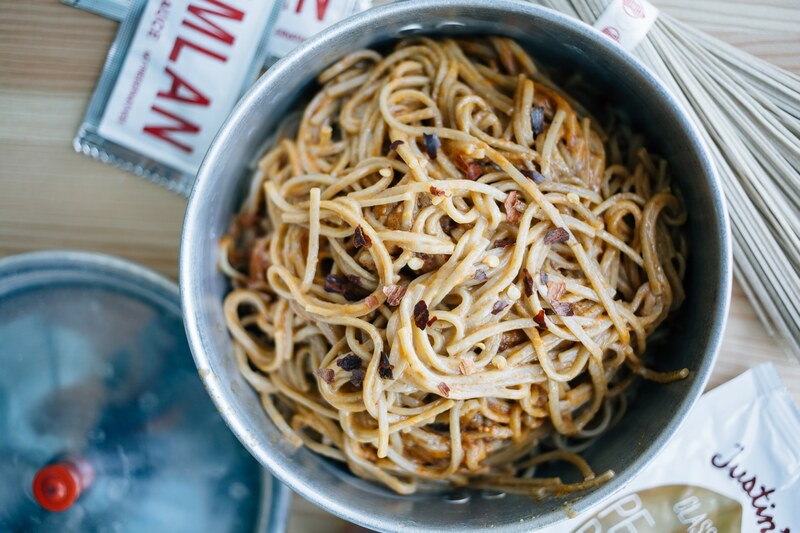 Perhaps it was the imagery of a hobo bindle filled with noodles, or perhaps it was the dishes fiery yet comforting warmth, but we both felt that Dan Dan noodles would be an excellent camp food. And best of all, it’s super easy to make. As with many of our camping adaptions, we tweaked the classic recipe slightly to make it more portable while still delivering substantial protein. We therefore dropped the ground pork, upped the peanut butter sauce, and opted for high protein buckwheat soba noodles instead of the usual flour noodles. When the weather turns against us or we’re feeling beat at the end of the day, this hot and spicy bowl of noodles is all we need to pick ourselves back up again. 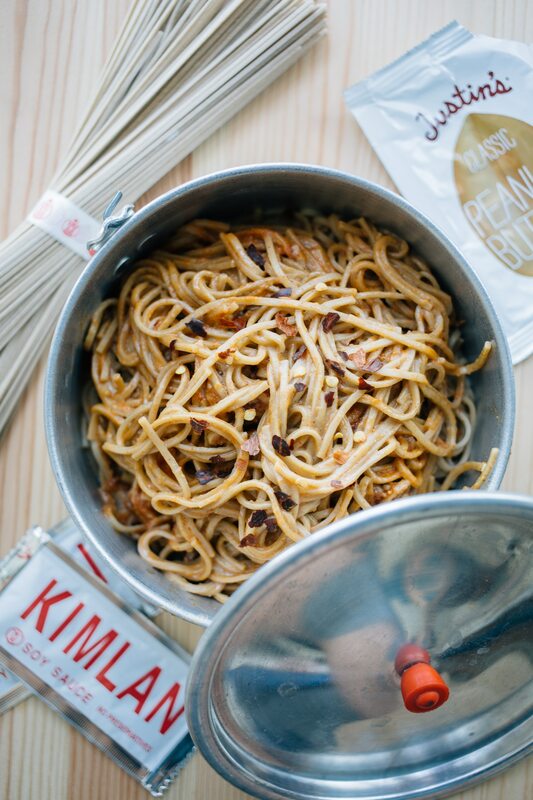 An easy one pot camping meal, this protein packed vegan dan dan noodle dish features buckwheat soba noodles coated in a flavorful spicy peanut sauce. Bring enough water to just cover the noodles to a boil. Once boiling, add the noodles and cook according to the package instructions – ours took 3 minutes. 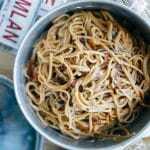 Once the noodles are done, drain off all but about 1 tablespoon of the cooking water. Mix in the peanut butter, soy sauce, sesame oil, and Sriracha. Thin out the sauce if needed with a little water. Sprinkle with red pepper flakes and salt to taste. Enjoy! For directions on how to prep and cook this as a high protein, packable backpacking meal, check out the instructions in our Vegetarian Weekend Backpacking Menu guide! For two hungry thru hikers would you recommend this serving size? or should we double it? Thanks!!! So based off my rough calculations, each serving of this is 500-800 calories and 20-30g protein, so the recipe as written is 1000-1600 calories and 40-60 grams protein. The variation in calories & protein is dependent on which noodles you use – different brands have differing calories & protein. I’d say that if you were eating this at home or on a short weekend hike, the recipe as written would be sufficient for two. BUT, I have done a month long thru hike before with 16+ mile days, and my appetite was MUCH different on that hike than on any other backpacking trip I’ve been on before or since! I probably could have inhaled this just on my own! !